Some airports, like Denver’s, aren’t known for easy and cheap public transportation to the city center. For years residents have complained about their options to get to the airport, which is actually 23 miles from downtown, and the drive often takes far longer than the usual 35 minutes due to heavy traffic on Interstate 70. All that changed last week. 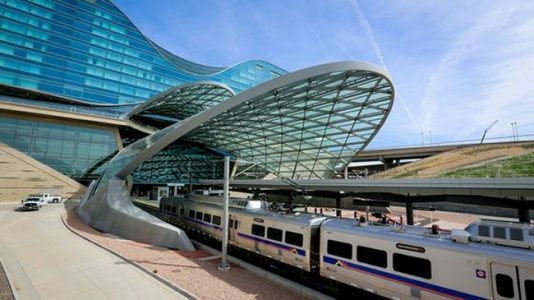 Local authorities on Friday launched a new Denver-DIA train service aimed at whisking people from the airport to Denver’s Union Station in just 37 minutes for $9. The train leaves the airport starting around 4 am weekdays, and runs every 15 minutes until nearly 1:30 am. DIA is the country’s fifth-busiest airport, with 53 million passengers a year, and the train is a long-missing transportation option. To read more about Denver’s train at USA Today, click here. To read about other US airports with commuter train service at NBC News, click here.